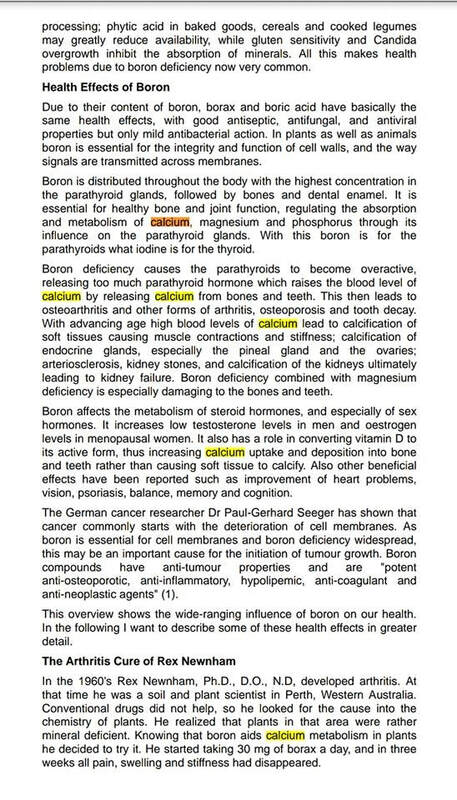 Boron has been proven to be an important trace mineral because it (1) is essential for the growth and maintenance of bone; (2) greatly improves wound healing; (3) beneficially impacts the body’s use of estrogen, testosterone, and vitamin D; (4) boosts magnesium absorption; (5) reduces levels of inflammatory biomarkers, such as hs-CRP and TNF-α; (6) raises levels of antioxidant enzymes, such as SOD, catalase, and glutathione peroxidase; (7) protects against pesticide-induced oxidative stress and heavy-metal toxicity; (8) improves brain electrical activity, cognitive performance, and short-term memory in elders; (9) influences the formation and activity of key biomolecules, such as SAM-e and NAD+; (10) has demonstrated preventive and therapeutic effects in a number of cancers, such as prostate, cervical, and lung cancers and multiple and non-Hodgkin’s lymphoma; and (11) may help ameliorate the adverse effects of traditional chemotherapeutic agents. Americans’ daily dietary intake of boron was estimated to be approximately 1 mg/d in 1999. Utility of boron for plants was demonstrated in 1910, and boron has been considered essential for plants since the 1920s. A major function of boron in plants is structural stabilization of the cell wall by cross-linkage of hydroxyl bearing moieties. Boron deficiency in plants is characterised by pathologic changes in the cell wall at the growing points. Boron-deficient plant tissues are brittle or fragile. Plants grown on adequate boron levels are flexible or resilient. Animals do not possess cell walls, but some tissues such as cartilage and neural tissue have abundant hydroxyl-rich extracellular matrix. The physis pathology in OCD parallels boron- deficiency effects in the cambium of plants. From these results, it may be concluded that osteochondrosis in swine apparently is a boron- responsive disease. There are many theories as to why borax helps with arthritis. Borax contains boron, a necessary nutrient for the skeletal system. Studies have found that strong bones contain more boron than weak bones. Borax helps to alkalize the body, which reduces pain and helps maximize the body’s health. Borax kills fungus and can therefore fight any fungal root to arthritis. Some believe that borax helps with lubricating the joints. Borax also neutralizes the fluoride added to tap water. Fluoride has a negative effect on the immune system. Reversing fluoride poisoning can only be a positive step towards better overall health and the decrease of arthritis symptoms.